The topic of Chinatown revitalization has been bandied about a lot in the past year, especially with flashy projects like the Yorkton Development residential towers and the Wild Rose Circle Development. But in the short term, existing businesses that bring people into the area will have a greater impact – no area can rely on large-scale developments alone. 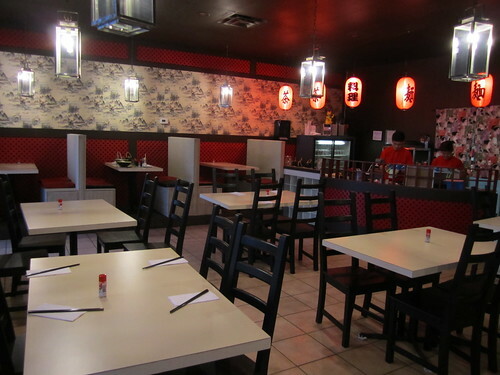 That’s why it was great to see that a new ramen joint joined the Chinatown fray in recent months. Instead of opting for a newer, suburban location, Meguro Ramen chose to situate itself in the heart of Chinatown on 97 Street, in the space formerly occupied by Padmanadi. In other large North American cities, the ramen trend has exploded, with eaters ravenous for hand-pulled noodles and umami broth. 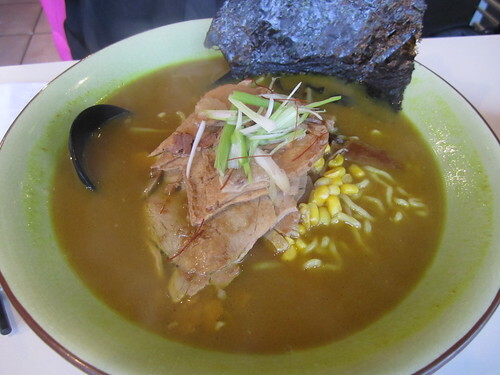 Ramen doesn’t yet have the same foothold in Edmonton, but we may get there soon if more restaurants with this focus continue to open up. During November’s cold snap, I met Annie at Meguro Ramen for lunch on a Saturday. Save for the instant version, my experience with ramen has been limited. But in many ways, because of my love of pho, I am already partial to oversized bowls of noodle soup. At the same time, I knew my bias would affect my reception of dishes outside the realm of beef broth and rice noodles. The interior has been completely transformed – gone is the buffet service, the dated paint, the wall of thumb tacked photos. In its place is a dramatic red and black room with paper and glass lantern accents, a space that I think would look even better after dark. Although Meguro does serve dishes outside of the ramen family (about ten appetizers, and three different rice bowls), we zoned in on their namesake entree. 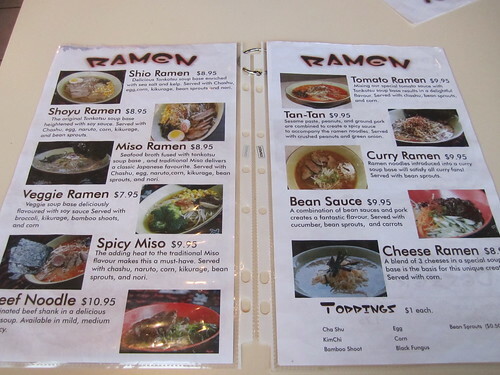 We had the choice of ten varieties, made up of different kinds of broth and toppings, including the most unusual combination of ramen and cheese of all things. I didn’t stray far from pho, ordering the beef noodle ($10.95), while Annie opted for the curry ramen ($9.95). Given we were among just three other parties, it wasn’t a surprise that our food arrived quickly. But we appreciated the expedient service, especially on that cold afternoon. The steaming bowls were garnished beautifully, while the atypical soup spoon helped round out its presentation. I enjoyed the beef very much, tender, with just the right amount of fat. 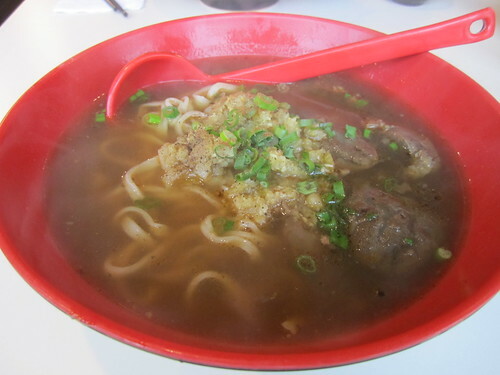 The noodles were quite good as well, thicker than I had anticipated, but satisfyingly chewy. The broth was a bit of a disappointment for me; bland and lacking flavour, I had to reach for quite a bit of the spice shaker on the table to liven it up. Annie had similar thoughts about her dish – thumbs up to the pork (which she found to be better than Nomiya), but was expecting a broth to have much more kick. Though our lunch didn’t quite show me what all the ramen hype was about, Meguro Ramen is close enough to my workplace that I think I will be back again soon – there are at least nine other ramen dishes that I’ll have to work my way through after all!